In OpenMETA we can pass values between different Parameters and Properties using ValueFlow connections. You can also use SimpleFormula and ComplexFormula blocks to perform calculations with the values as they are passed around. When a Test Bench is executed with a Component Assembly as the TopLevelSystemUnderTest reference, the CyPhyFormulaEvaluator runs and resolves the values. We can also use these Value Flow connections to “wire out” values from the TopLevelSystemUnderTest to Metrics in the Test Bench. For example, in the Test Bench below, three properties from the model of a truck are extracted to Test Bench Metrics. Depending on how few different components and properties you have in your OpenMETA project, it may be possible to use Value Flow to wire all the needed values out of your model, but as the complexity of the model increases, it quickly becomes infeasible to wire out every property you want to extract from a system model. The ValueAggregator.py script was designed to make the task of gathering values easier. Each Test Bench must include a reference to a Workflow. 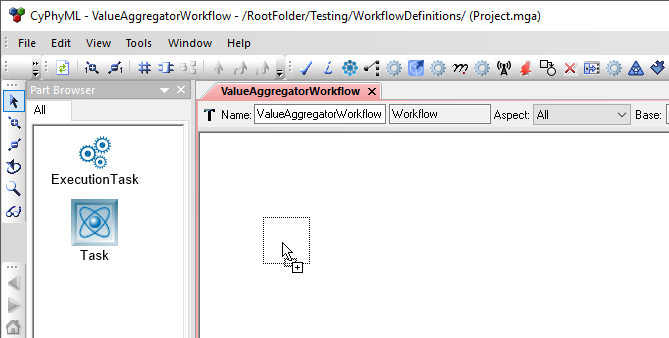 Workflow models must reside in a Workflow Definitions folder. 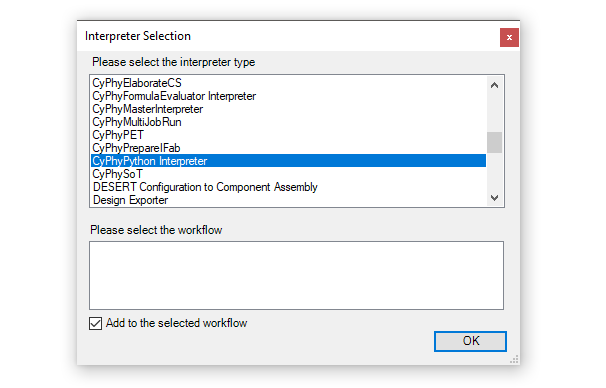 A Workflow defines the selection and order of execution for the Interpreters and other scripts in a Test Bench. If a Workflow Definitions folder doesn’t exist in your Testing Folder, you can add one by Right-clicking the Testing Folder and selecting: Insert Folder ‣ Workflow Definitions. Add a Task to the Workflow by left-click-dragging a Task from the GME Part Browser onto the canvas. 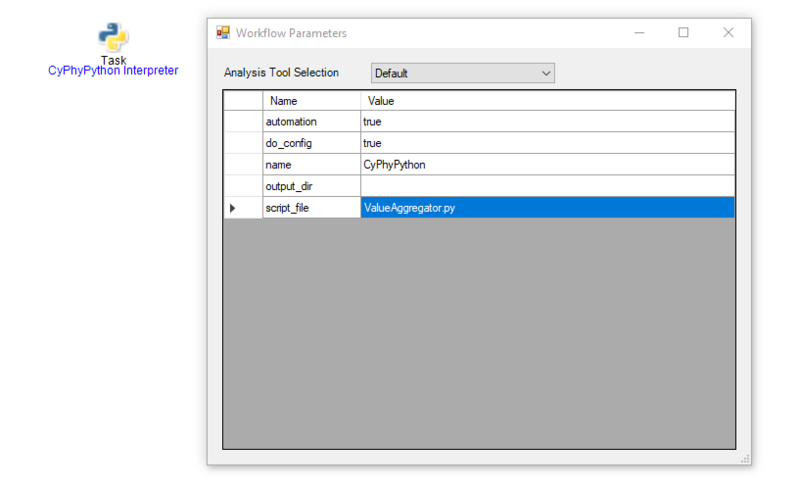 Then select CyPhyPython Interpreter in the dialog box that appears, and click OK.
Double-click the resulting Task object and enter “ValueAggregator.py” into the script field, then close the window. After the Workflow Definition is correctly configured, you can define the different queries that you want to perform on the model. An OpenMETA property in the Test Bench is required for each query you would like to perform. The Description attribute of the Property is where you will place the definition of the query. name: The name of the property that will be found in the model. This name must be an exact match and is case-sensitive. classification: The classification node used to filter the query. Each component has a Classifications field that is normally used to hold the ontological classes to which that component belongs. The classification field of the query must match one of the nodes defined in the Classifications field of the parent component of the property. Again, the match must be exact and is case-sensitive. Leaving the classification field blank or using an asterisk signifies that there is no restriction based on classification. * or SAMPLE Returns the last value that is encountered. + or SUM Sums all the values that are found. AVERAGE Returns the average of all the values that are found. COUNT Returns a count of the number of properties that are found. MAX Returns the maximum value that is found. MINIMUM Returns the minimum value that is found. AND Returns the boolean && of the values that are found. OR Returns the boolean || of the values that are found. 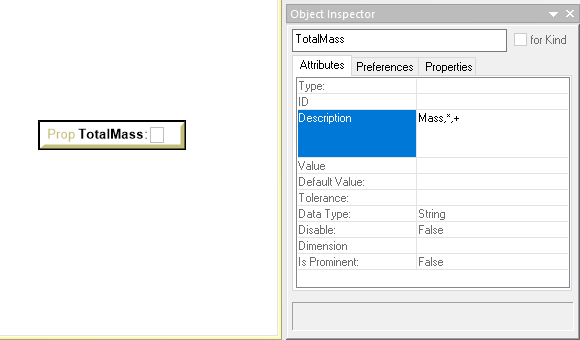 For example, the query in the images above, Mass,*,+, would return the summation of all the values in properties or parameters named “Mass” in components in the TopLevelSystemUnderTest, and Mass,,COUNT would return a count of the said properties or parameters. After you have all your queries properly added, you only need to assign the resulting values to Metrics so they can be recorded and, if executing in the context of a PET, passed to other analysis blocks. Similar to the queries themselves, an assignment is accomplished by adding an assignment statement to the Description attribute of a Test Bench Metric. In the image above, you can see that the Total Mass that was calculated with a query is being assigned to the VehicleMass metric. These assignments are evaluated in Python and have access to all of Python’s built-in functions for manipulating numbers as well as the math module. See Section 2: Built-in Functions and Section 9.2: Mathematical functions of the Python 2.7 Documentation for more information. © Copyright 2017-2018, Metamorph Software, Inc..